A privately built robotic spacecraft is doggedly chasing down the International Space Station and remains on track for an early-morning arrival Wednesday (Oct. 10) to deliver a half-ton of supplies. The Dragon space capsule is making the first commercial cargo delivery to the space station for NASA under a billion-dollar deal with the private spaceflight company SpaceX, which launched the spacecraft from Florida atop its Falcon 9 rocket on Sunday night (Oct. 7). "The Dragon spacecraft continues to look great, and all systems are performing nominally," SpaceX officials said in a mission update today (Oct. 9). The space capsule is expected to rendezvous with the International Space Station early Wednesday. Astronauts inside the station will use a robotic arm to capture the Dragon capsule and attach it to an open docking port so it can be emptied of the nearly 1,000 pounds (454 kilograms) of supplies and gear inside. If all goes well, NASA astronaut Sunita Williams and Japanese astronaut Akihiko Hoshide will capture Dragon at 7:22 a.m. EDT (1122 GMT). NASA will broadcast the event live on NASA TV and online. You can watch the Dragon docking webcast live here beginning at 4 a.m. EDT (0800 GMT). Satellite trackers also have one last chance to see Dragon in the night sky tonight before it docks at the space station. But you have to know when and where to look. For tips on spotting Dragon and the station as they fly overhead your location, see: "How to Spot SpaceX's Dragon in Night Sky." The Hawthorne, Calif.-based SpaceX is one of two companies with commercial NASA contracts to launch unmanned cargo missions to the space station. SpaceX has a $1.6 billion deal for at least 12 Dragon cargo flights, while the Virginia-based Orbital Sciences Corp. has a $1.9 billion agreement to provide NASA at least eight delivery flights using its own Antares rockets and Cygnus spacecraft. The current Dragon cargo flight is the first of the company's 12 contracted flights, though SpaceX did launch a test flight to the station in May. It is slated to return to Earth on Oct. 28 carrying about 2,000 pounds (907 kg) of scientific experiments and station gear. Orbital Sciences, meanwhile, is gearing up for its first Antares rocket test later this year. With NASA's space shuttle fleet retired, the space agency is depending on private space taxis for ferrying cargo and astronauts to the International Space Station. SpaceX, which is upgrading Dragon to carry crew, is one of four private spaceflight companies that have received funding from NASA to develop new manned spacecraft. 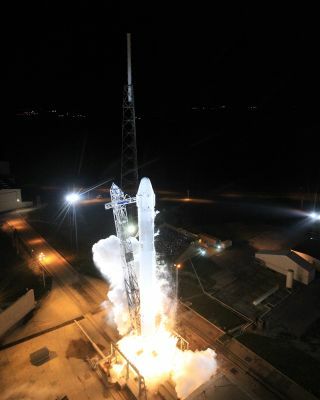 Visit SPACE.com this week for complete coverage of SpaceX's first Dragon cargo flight to the International Space Station.